In The Deep History of Ourselves LeDoux argues that the key to understanding all human behavior lies in viewing evolution through the prism of the first living organisms. By tracking the chain of the evolutionary timeline he shows how even the earliest single cell organisms had to solve the same problems we and our cells have to solve today in order to survive and thrive. Along the way, LeDoux explores our place in nature, how the evolution of nervous systems enchanced the ability of organisms to survive and thrive, and how the emergence of what we humans understand as consciousness made our greatest and most horrendous achievements as a species possible. "Joseph LeDoux deepens our understanding of a profound question as old as Aristotle: how does our mind set us apart from other species? We could not have a better guide: LeDoux is a world-leading neuroscientist whose research has taken him to the frontiers of behavior, emotions, and consciousness. 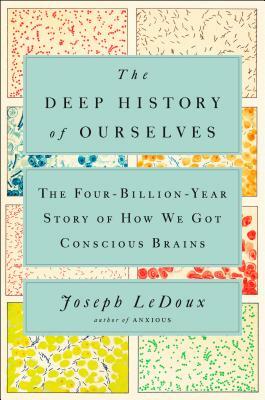 With brilliance, wit, and wisdom, LeDoux traces four billion years of life, showing how humans share basic behaviors with one-celled organisms yet soar to a reflective self-awareness that may be unique in the universe. Utterly fascinating and a thrill to read."